Salade composee aux bettraves roties, noix et bleu. Growing up in the North of France beets where prevalent. The weather in the area is cold for France, so the farms focus on hardy vegetables and fruits. A popular crop is sugar beets which are white and a lot larger than the typical red beet. There was a sugar processing plant in the town where I went to school and we drove by it on our way home everyday. During harvest season, traffic around town was heavy with trucks filled with the sugar beets, still covered in earth from the fields. Fortunately some farmers also grew the red beet variety which let us enjoy the region's crop. This salad is a "salade composee" which means that it is arranged directly on the serving plate as opposed to being tossed in a saladier. We roasted red beets in the oven which makes them sweet. It also makes it a lot easier to peel them, as the beets want to pop out of their skins when they come out of the oven. We cooked the beets "en papillotte", or in a foil packet. 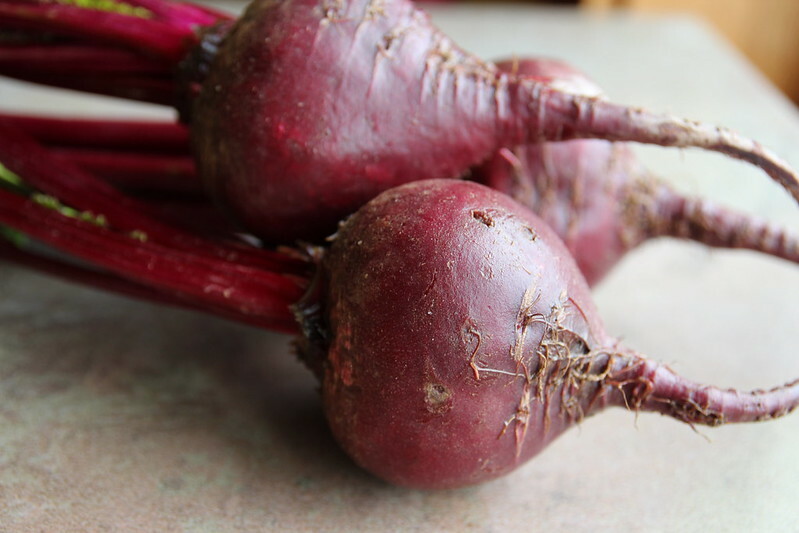 Beets can be roasted anywhere between 375 and 425 degrees, the lower temperature just takes longer. These were roasted at 425. These beets were medium in size, and it still took about an hour in the oven to get them tender. Once they are out of the oven, you will need to wait until they cool off a bit. I waited until I could handle them without burning my hands and it was easy to peel the skin off with my fingers. After that, I let them cool completely before cutting them in small wedges. I made a vinaigrette with the mustard "a l'ancienne", which has those nice mustard seeds in it, olive oil, shallots vinegar and some fresh finely chopped shallots as well. My ratio is 1 mustard, 2 vinegar, 6 oil. 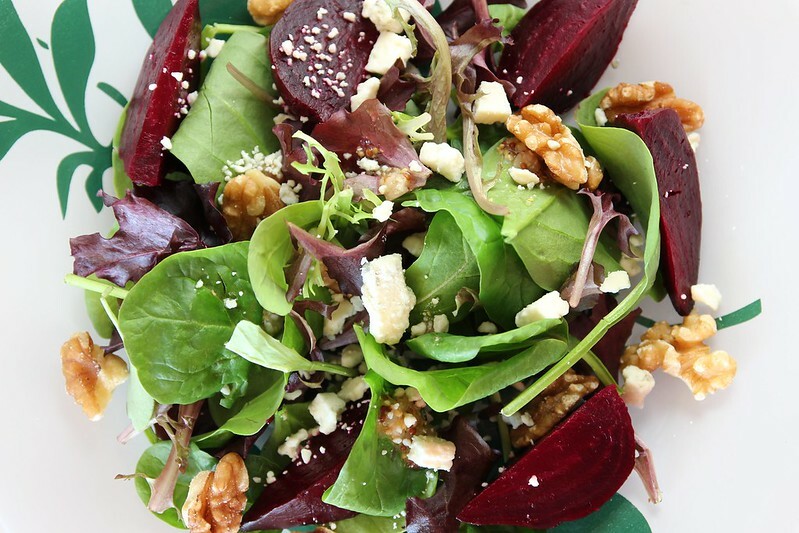 To serve the salad, spread some spring mix lettuce or a mesclun mix on the serving plate, followed by the wedges of beets, some walnut kernels and blue cheese. Roquefort was unfortunately unavailable. Drizzle the vinaigrette over it. And voila: salade composee aux bettraves roties. If you haven't tried roasted beets before, go out on a limb and give them shot. They really couldn't be easier and are delicious. Bon Appetit!